"I came up with this recipe to try and use an abundance of cilantro from my garden. It's easy and the whole meal is one pan." Heat the olive oil in a large skillet over medium heat. Dredge chicken in flour to coat. Place chicken in the skillet, and cook just until browned on all sides; set aside. Stir onion, bell pepper, and garlic into the skillet. Cook 5 minutes, until tender. Pour in chicken broth. 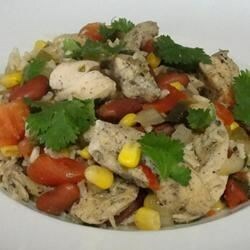 Mix in the yellow rice, stewed tomatoes, pinto beans, black beans, corn, diced green chile peppers, and cilantro. Season with salt, pepper, and cayenne pepper. Bring to a boil. Return chicken to skillet. Reduce heat to low, cover, and simmer 30 minutes, until rice is tender and chicken juices run clear.